Ben goes Inside, and emerges a changed man. Update: Inisde is now available on the Nintendo Switch, meaning it can hopefully make it's way into the hands of those not lucky enough to experience one of the best Indie games of the current generation. We've played it all the way through again and compared it with the other consoles and it holds up just as well on the Nintendo Switch. 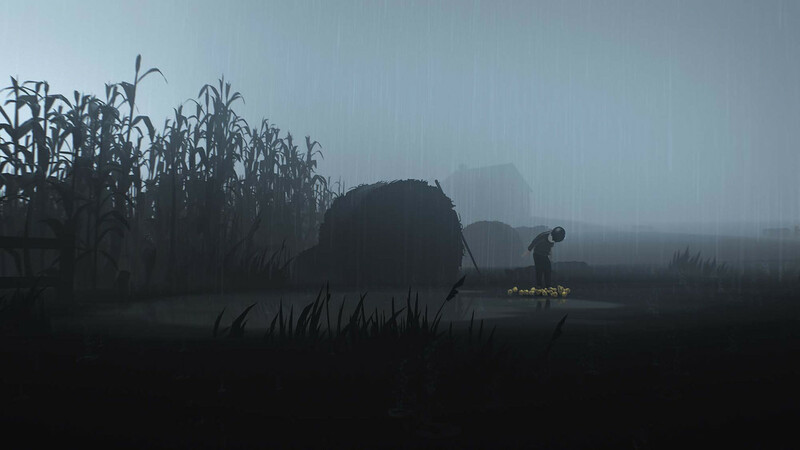 The graphics and art style are still as gorgeous as ever, along with the top notch soundtrack which further adds to the gloomy mood of the game. Inside is a must-play for anyone even remotely interested in the whole "games as art" argument. If you're yet to play it, we highly recommend you remedy that as soon as possible. Some real-world background info before talking about Playdead’s Inside; I’d received a download code that didn’t allow me access to the game until it’s official launch. Having completed watching the final few episodes of the excellent Master of None on Netflix until near midnight, I was about to go to bed when the Xbox dashboard popped up a notification indicating that the international dateline had ticked over and the game was now playable. “Oh!” I thought. “I'll have a crack for half an hour or so to get an idea, then go to bed”. At four in the morning, I found myself staring utterly agog at my television screen, having played the game from start to finish, with all thoughts of a relatively early night long since abandoned. If Inside was a book, the word you’d pull out would be “unputdownable”. As it's a game, we could perhaps try calling it a “screengluer” – the kind of gaming experience that’s so good that it’s going to actually adhere you to your video device until it’s done with you. Here’s the real deal, folks; one of the most memorable gaming experiences of this or any other generation. It’s hard to talk about Inside in too much detail, because this is a game that needs to be experienced without spoilers (for emphasis again now; DO. NOT. spoil yourself on this game before playing it). 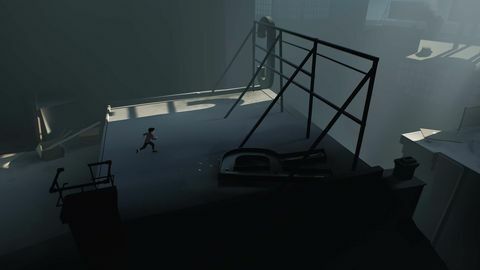 But in general terms, it’s a puzzle platformer reminiscent in many ways of Playdead’s smash hit debut Limbo, itself a work of excellence. Begin the game and without explanation, backstory, or text of any sort to clue you in as to what’s happening, a small boy slides down a rough scree slope and into a foreboding night-time forest, with the rest of the game awaiting him off-screen to the right. All he has at his disposal are a jump, the ability to grab and push or pull items, and an air of fearful determination. So far, so Limbo. But with a bigger budget to work with, Inside has added another half a dimension, to glorious effect. The marvellously animated boy runs, jumps and stumbles through a gorgeously rendered, spectacularly lit and gloomy 2.5D world, where backgrounds house mysterious visual storytelling (the only type of story the game will offer), a sense of grand scale, and often a threat. For soon after the boy enters the forest, it is clear he is in trouble; mysterious men are searching for him, and won’t hesitate to run him down, shoot him with tranquiliser darts, or set vicious dogs on him (although later in the game, being torn apart by dogs will come to seem like a good option). As in Limbo, the boy is defenceless, and can only outrun, outwit or hide from his pursuers in order to escape. 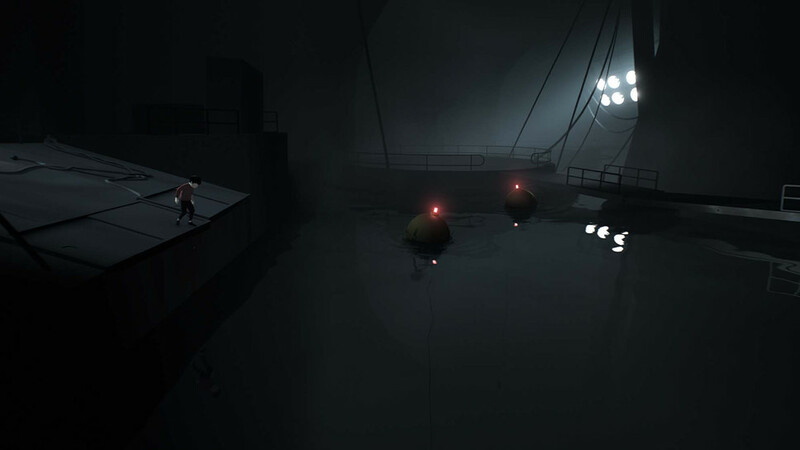 Gameplay throughout Inside tends to shift between tense pursuit sequences in which the boy must flee for his life, quieter moments in which he’s faced with an environmental puzzle that impedes his progress, and situations that combine these two elements. 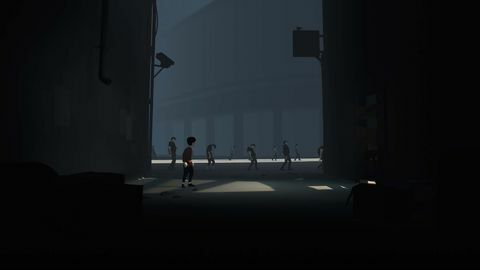 The instinct to run away like a dumb panicky animal in many situations is hard to overcome, especially given the atmosphere Playdead creates in the game, which at minimum is always set to “creeping dread” and often ramps up to “bewildering terror”. Not helping are the various hideous fates that it quickly becomes apparent await the boy should he be caught. But headlong-running-away rarely does the trick, and the player most often needs to overcome their expertly-triggered flight response in order to think before they act, paying attention to the environment and circumstances in order to escape. Pitch perfect timing on the part of the game ratchets up the tension to thriller levels, making every escape a matter of split-seconds and centimetres. 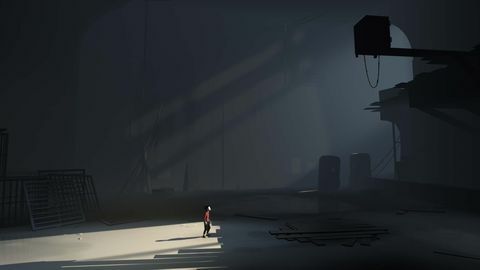 As in Limbo, Playdead does a lot with the puzzles given their protagonist can only jump and push or pull things around. 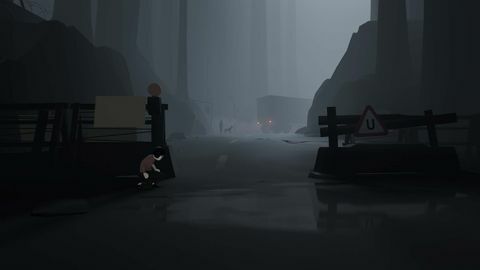 Inside has a meticulously constructed learning curve, introducing each new environmental mechanic in a simple way, before putting them to use in more complex situations. Pay attention as you’re playing, and you’ll learn that lift boxes always rise to the same height, and the submersible’s light goes out for a couple of seconds when you bump against the wall; these are incidental details at first, and crucial information for progress later on. It wouldn’t be fair to get into the various bizarre scenarios the game asks you to get your head around, because discovering them for yourself is most of the fun. But in all the weirdness, you’re never required to make any sort of logical leap to solve a puzzle, because the game always carefully if subtly demonstrates the rules of every new element. Eluding his pursuers in the forest, the boy makes his way through farmland, where the first hints that something is seriously amiss are dropped, and on into a foreboding, decaying complex of massive size, where truly nefarious things are afoot on an industrial scale. Here’s where the review has to stop getting descriptive; what the boy finds and survives needs simply has to be discovered by playing the game. Without ever uttering a word of dialogue or providing any text beyond the occasional numeral, the (sometimes horribly) gorgeous game and its imaginative design presents a compelling, mysterious and horrifying dystopia, never spelling out a story so much as suggesting one. Throughout it all, there’s a feeling of dread, and a pervasive sense of soul-deadening, inescapable oppression; this is a world in which the nightmarish long ago became mundane. The boy is seemingly pitted against an entire system, and the odds he faces are vast and terrifying (one mid-game enemy in particular had a direct line into my heebie-jeebies). Themes of decay, enslavement, free will and control, societal division, and the potential evils of unrestrained science all bubble to the surface in the background and world as the boy makes progress, and the player is compelled to delve onwards and deeper to see where it all leads. And where it leads is to one of the most (literally) jaw-dropping ending sequences in the history of gaming, an astonishingly bravura passage of play that leaves you blaspheming at the screen in a whirlwind of emotions, wondering exactly what it was that you just did. It really has to be played to be believed and like all truly great endings, it makes you re-examine everything that has come before it in a new light. The credits sequence of the game seems almost deliberately designed to give you a long, contemplative moment to breathe and think back on everything that has just happened; I used it. As with Limbo, there are plenty of questions at the end of it all, and they make you want to go back and experience it all again. Finally free of the game’s hypnotic spell at the end of my playthrough session, I had an unprecedented feeling; a burning desire to share the experience of playing the game with other people. “Come over Friday night and watch this singleplayer game being played” is sort of a weird invitation to issue, but I issued it anyway, because Inside is a game you desperately want to talk to your friends about. Simply watching it a second time, even more rich detail emerges, only creating further hints and questions about the nature of the world; an observing woman holding a baby, a camera on a tripod, the hint of an organic nature to an underwater structure. It’s a rare game that keeps you ruminating over the meaning of its background elements long after you’ve finished playing it. It’s also a rare game that demonstrates exactly what the medium as a whole is capable of. Do not wait: play it. Ups Glorious 2.5D presentation; lighting, physics, art direction, and even framing choices all faultless. A mysterious, malevolent and compelling world created by sheer dint of the imagination and skill the visual storytelling on display in the environments. Clever puzzles, each carefully introduced via a perfect learning curve. Full of tension-filled, eerie and awe-inspiring moments that will make the hair stand up on the back of your neck. That ending. Man, THAT ENDING. Probably one of the most amazing gaming sequences ever. Downs If you have a PS4, you can’t play this yet. Get it on PC (on July 8) or go to your Xbox-One-owning friend’s house. From the makers of Limbo. So much for console exclusivity.